Black and Decker has been making their Dustbuster vacuum for many years now, and it’s a time-honored design. Just the fact that the word “Dustbuster” is synonymous with handheld vacuums in some places shows how significant and popular it has become. Let’s take a look at one of their newer models, the CHV1410 Dustbuster 14.4-Volt Cordless Handheld, and find out if it measures up. With 14.4 volts of power, this vacuum actually isn’t that far behind one of Black and Decker’s more top of the line models, the BDH2000L, which has 20 volts. Here’s the trick: either way, 14.4 volts is the same as many larger cordless vacuums that are designed to clean floors, so it’s great regardless. There’s many reasons the Dustbuster brand is well-known, and one of them is great performance. The CHV1410 matches up well to that reputation – it channels its strong power through a medium-sized nozzle that is wide enough to clean up messes quickly while still having robust suction. Speaking of that nozzle, it actually rotates so you can more easily find that sweet-spot angle that all vacuums have for maximum suction. Its well-placed loop handle makes it easy to let the vacuum dangle from your grip in a relaxed way so you can best utilize that nozzle-feature. Here’s the one issue with the CHV1410: it has a NiCad battery. That’s not the greatest option – most especially because of its 24 hour charging time – but as I’ve already noted, it generates a great amount of power. The charger is also Energy Star approved and has a charging light, so those points do help a little as well. If the long charging time and merely “average” runtime are a problem for you, the CHV1410L is available. It’s identical, except it comes with a Lithium-Ion battery, but does cost considerably more. The CHV1410 weighs in at about, well, average: 3.26 pounds. That’s neither good nor bad for a handheld vacuum, but the ergonomic loop handle makes it so you don’t notice the weight so much anyway. This Dustbuster’s filter is in the same category as its weight; its three-stage filtration system is better than a cheap, papery filter, but it’s not the best filter that could be used, either. With 20.6 ounces of space for dust and debris, the dust bin on this vacuum is actually well above average – you’ll definitely end up filling it anyway, though, with such great performance, so it’s good it’s so large. The CHV1410’s nozzle is just full of little tricks, it seems! A brush is attached right on the side of the nozzle (so there’s no chance of losing it), and a crevice tool extends directly from the nozzle; the latter actually reaches far enough that you won’t even have to kneel or bend over in certain situations. Considering reliability for this vacuum circles us back around to the battery – NiCads are simply known for having memory effect issues, and not being as reliable as other options in general. The construction of the CHV1410 itself is solid and p to Black and Decker standard, though. Black and Decker also keeps things on the up and up with a two-year limited warranty, so even if the battery does have some issue, you’ll be covered. Price is a definite positive point for this Dustbuster – it’s quite affordable. And, put in the perspective that it costs half as much as a top of the line Black and Decker handheld and has almost as much power, it’s very affordable. 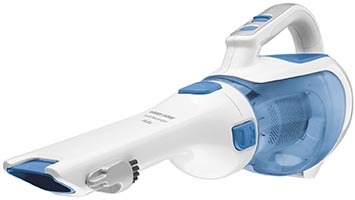 In short, the CHV1410 is a great vacuum. Having a NiCad battery isn’t so much a sin as it might seem – really, most vacuums have used that type over the years. Here’s the thing with the Dustbuster, however – there’s an almost identical Dustbuster model that uses a much better Lithium-Ion battery. You just have to ask yourself, do you want to pay a little more for the better battery, or pay a little less and gamble with the small chance of an unreliable battery? Luckily, with Black and Decker the odds are you’ll win either way.